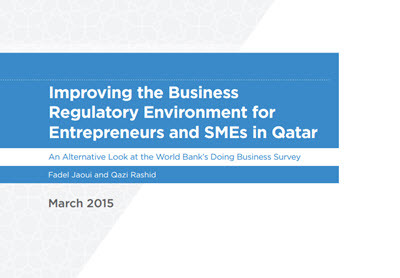 In line with the Qatar National Vision 2030 and the National Development Strategy, this policy report aims at identifying dimensions of business regulation that require attention from policymakers to ensure a more business-friendly regulatory environment in Qatar, using the World Bank’s Doing Business survey results. While Qatar is relatively well positioned in the world Ease of Doing Business rankings, standing at 48 out of 189, recent trends have shown a fall in rankings due to insufficient regulatory reforms. This report identifies key potential areas of regulatory improvement that affect essential stages of a company’s life cycle, namely access to finance – which depends on the ease of getting credit and investor protection – and during the start-up phase. To improve access to finance, the report recommends reinforcing borrowers’ and lenders’ legal rights under collateral and bankruptcy laws (Commercial Law No. 27, 2006 and the Civil Code No. 22, 2004); and deepening the coverage, scope, and accessibility of credit information (Qatar Central Bank Law No. 13, 2012). To better protect investors, the report suggests strengthening disclosure rules of related party transactions, reinforcing company directors’ liability regime for self-dealing, and providing greater access of internal corporate information to minority shareholders (the Qatar Financial Markets Authority Corporate Governance Code, 2009). Finally, recommendations to ease of starting a business include improving both the online procedures and the one-stop shop experience while complying with the requirements of Qatar’s Commercial Law, 2002; and removing both the requirement for a company seal (or make the procedure optional) and the paid-in minimum capital requirement (Commercial Law No. 5, Article 232, 2002). These policy recommendations, if implemented, can significantly increase Qatar’s Doing Business ranking from 48th to 18th, and more importantly help improve the regulatory business environment for the private sector, in particular entrepreneurs and SMEs.